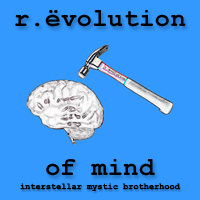 r.evolution of mind - ¿WHO? To contribute to the r.evolution of mind, saving the inventor`s spirit and gaining individual value, you should recognise the following wishes, views of the world and intentions on yourself. I consider necessary the rethink and the reorganization of views, values and doctrines. I have the great wish, to do something for it. I have the intuitive feeling that I have to go somewhere, that I want to arrive somewhere, that I have to express something or that I have to change something. Exchange, inspiration and consequently helping each other is my desire to conceive. I know, that I am responsible for my life, thinking, acting and the resulting consequences, all by myself. I will refine myself, I am interested in evolving my creative potential, I want to get to know myself and the world, study and know how she works. Out of the neutral consideration of world, society, system, and finally the own mind grows realisation. I respect the ways of others, because everybody has his own way and history. All human beings are connected on a rudimentary basis and therefore all the same. Every thing, animal, human being and the whole world inheres natural majesty which you should respect. Expectances and dependences cause suffering, alike every thought of possession. A connection based on veracity and free of expectances and dependences is the only satisfying form of community. I´d like to overcome my adherences and solve the involvement in the world, because they are the source of all problems. I want to deliver myself from illusions and self-conceit because being aware, being in peace with yourself and acting substantial, gives you satisfaction. Conditions caused by substances or in any other way artificial, enlarge the entanglement of oneselfes to the world. Every change begins with myself. The conscious act is the simplest key to letting go.